We intend for our rules to be similar to those of other major vintage-race sanctioning bodies in the region, so that drivers need not make extensive changes to existing cars in order to participate with our club. Please refer to the VRG Mission Statement for our general philosophy regarding safety, driving behavior, and performance modifications. Our mission is to promote the active use of vintage cars in a format that emphasizes safety and enjoyment. It is appropriate to recognize that vintage racing is an amateur sport, where the pleasure of taking part must exceed the desire to win at all costs. No set of rules can cover every situation, particularly in the case of a broad range of vintage vehicles, whose production spans many decades. These rules include our requirements, and numerous recommendations. Recommended items are not strictly required, but such recommendations should be given serious consideration by the car owner and driver. Possess a current, valid competition license and current race medical documentation as described below. Continuously demonstrate the attitudes and behaviors that are in keeping with spirit and best practices of vintage racing as described in the VRG Mission Statement and throughout VRG’s policies, Rules of Conduct, guidelines and educational content. Are not currently suspended from competition by VRG, the Vintage Motorsports Council (VMC) or other race sanctioning body. Participate in the VRG Driver Orientation Program (DOP). Establish, periodically review and revise as needed the licensing and behavioral standards which will be applied to all drivers participating in VRG races. Report to the VRG Membership Chair with decisions to award a VRG Competition license or a VRG Provisional Competition license. Review and respond in a timely fashion to requests by any driver whose competition license is either inactive or not currently recognized by VRG to participate in a VRG race. Such drivers are advised that poor planning on their part will not constitute and emergency on the part of the Driver Eligibility Committee. Work in collaboration with the VMC as appropriate to help assure best licensing practices throughout the vintage racing community. Investigate all racing incidents where a car damage and/or personal injury has occurred as well as any other incident which may affect the safety of VRG competitors or track officials referred to them by the Chief Steward. Report to the Driver Committee Chair and Chief Steward their findings and recommendations for all incidents. In making their recommendations the committee will make every effort to be fair and consistent based on the facts of each case. The Driver Committee Chair and the Chief Steward are jointly responsible for considering the recommendation, finalizing the decision and implementing any disciplinary action including reporting to VMC. VRG members who meet all training, experience, and other eligibility requirements to the satisfaction of the Driver Eligibility Committee will be awarded a VRG Competition License by the VRG Membership Committee. Holders of a current VRG Competition License are eligible to participate in any VRG race subject only to disciplinary restrictions imposed by the VRG Driver Committee or the VMC. VRG Competition Licenses are renewed by the VRG Membership Committee annually concurrent with membership renewal. At a minimum the VRG Competition License includes the member’s name, license number, license expiration date, and medical expiration date. Presentation to the Chief Steward of their VRG Provisional Driver Event Confirmation (PDEC) form at the beginning of the event. Upon successful, incident-free completion of the event, the Chief Steward will sign off on the form and return it to the driver. Upon successful, incident-free completion of three VRG events within two race seasons, the driver is required to send the completed form to the Driver Eligibility Committee who will make the final decision to award a VRG Competition License. While VRG Provisional Competition License holders may be accepted for participation in events sanctioned by other clubs, only VRG events will be counted toward a VRG Competition License. Application of “Novice Stripes” to the rear of car. Novice stripes are two parallel slanted stripes approximately 1 to 2 inches wide and approximately 8 to 10 inches long in a contrasting color to the body of the racecar. Presentation to the Chief Steward of their VRG Provisional Driver Event Confirmation (PDEC) form at the beginning of the event. Upon successful, incident-free completion of the event, the Chief Steward will sign off the form and return it to the driver. VMC – all holders of a VMC Competition License or a Competition License issued by a VMC member club are eligible to participate in any VRG race subject only to disciplinary restrictions imposed by the VRG Driver Committee or the VMC. Non-Vintage Competition Licenses – Current or formerly licensed “club” racers such as SCCA, NASA, BMW, PCA, etc. may eligible to participate in VRG races at the discretion of the Driver Eligibility Committee as described in 1.2.1 above. Such experienced drivers whose credentials are accepted by the Driver Eligibility Committee will be required to complete VRG’s Driver Orientation Program (DOP) before participating in a VRG event. Other Competition Experience – VRG recognizes that the above categories are not exhaustive and that other experience may quality a driver to race safely and competently in the vintage environment. Such drivers are invited to contact the Driver Eligibility Committee to present their competition resume and other credentials for consideration as described in 1.2.1 above. Such experienced drivers whose credentials are accepted by the Driver Eligibility Committee will be required to complete VRG’s Driver Orientation Program (DOP) before participating in a VRG event. Track Day/HPDE – In general these events are understood to be non-competitive by their nature with restrictions such as limitations on passing, prohibition of wheel-to-wheel driving or limited speeds. While seat time in these events can be very helpful for learning car control and high speed driving techniques, they are not sufficient preparation for safe, competent participation in wheel-to-wheel vintage racing. Track Day/HPDE drivers and instructors will be required to successfully complete an approved racing school before the Drive Eligibility Committee will consider them for a VRG license at any level. Other schools will require approval by VRG. SCCA schools will only be credited if the applicant has obtained a Regional or National license within the last two years. Those applying should submit a copy of their diploma(s) and a list of instructors, including the name and contact information for the Chief Instructor. 1.5. Physical Condition: Vintage racing is dangerous and can be very stressful. Each VRG driver must be examined by a physician, and submit a standard race medical form (VRG, SCCA, or SVRA form). This must be renewed every two years. Drivers over age 40 are strongly recommended to have an EKG as part of the medical examination. Additional diagnostic testing, such as cardiac stress test or other appropriate test, is left to the discretion of the examining physician who will sign your medical form. 1.6. Unsportsmanlike Conduct: When a driver has been considered to have behaved in an unsportsmanlike manner, either on the track or off the track, in disregard of the VRG Mission Statement, that driver will be excluded from the remainder of that race event, and may be refused admittance to future VRG events. 2.1. Eligible cars: The VRG Eligibility Committee will resolve any questions about eligibility. Subject to the definitions below, the following types of cars are eligible. 2.1.1. Sports and GT on sale to the public on or before 1/1/1989. 2.1.2. Selected sedans on sale to the public on or before 1/1/1989, as recognized by SCCA or FIA. 2.1.3. Sports-racing cars, including prototypes, limited-production sports and GT cars, “modified” cars and “specials”, manufactured before 12/31/1972 on treaded tires. Examples: SCCA B/Modified through H/Modified; A/SR through D/SR; FIA World Sports Car Championship, World GT Championship, World Championship of Makes; USRRC and early Can-Am cars on treaded tires. 2.1.3.1 Sports 2000 eligible under current VS2-NA rules as recognized in Paragraph 2.3.7 of these rules. Section 4.9 “Tires” does not apply to cars eligible under this section. 2.1.4. Formula cars eligible under current Monoposto Classic rules, in production before 12/31/1972. Examples: FJr, FVee, FB, F1, F2, F3. In addition, Historic Formula Fords, Club Fords and later Formula Fords as recognized in Paragraph 2.3.8 of these Rules, and Formula Vee’s as recognized in Paragraph 2.3.9 of these Rules. 2.1.5. Pre-war sports and racing cars of compatible performance. 2.2.1. Continuation cars: A car in continuous production after the cut-off date, but identical in specification to cars in series production before the cut-off. 2.2.2. Special: A car built in extremely limited numbers, often one of a kind. Normally a unique combination of chassis/body/engine. May be eligible in VRG sports-racing class if all major components (engine, running gear, body, chassis) were manufactured prior to the cut-off date, and approved by the VRG Eligibility Committee. 2.2.3. Modified car: A production vehicle that has been modified beyond the rules of the relevant production class (replacement engine, modified chassis, re-bodied). May be eligible in VRG sports-racing class if constructed of components manufactured before the cut-off date, and approved by the VRG Eligibility Committee. 2.3. Classifications: The eligible cars described above, will be subdivided into VRG Classes. Please note that classification will be based on performance potential of the specific year, make, model, and options and may not correspond rigidly to a displacement guideline for the class. In general, the suffix “V” indicates older (vintage) models, and the suffix “H” indicates slightly newer (historic) models. Also note that Race Groups will be determined for each VRG event based upon actual entries for that event. 2.3.5. Sports racing cars, Modifieds, Prototypes and limited production GT cars through 1965. 2.3.6. Sports racing cars, Modifieds, Prototypes and limited production GT cars 1966-1972. 2.3.7 Sports 2000 Racing Cars, prepared to VS2-NA specification. Cars or modifications to S2 class are specifically not eligible. HS2: S2000 cars produced before 12/31/1984, conforming to VS2-NA rules, including the following: Aquila; Chevron; Crossle; Lola T-490, T-492, T-590, T-592, T-592S; March; Martin, MRC/81 (Mariah); Ocelot; Robinson; RoyaleS2000M, RP37; Tiga SC78, SC79, SC80, SC81, SC82, SC83, SC84. VS2: S2000 cars produced between 1/1/1985 and 12/31/1986 and continuation models in production after 1/1/1987 conforming to VS2-NA rules. Cars include the following: Apache; Lola T-594, T-596, T-598, T-86/90; Royale RP38, RP42; Shrike P15; Swift DB-2; Tiga SC85, SC86, SC87. CF: Club Ford, second generation, post-1972 with outboard suspension on at least one end as originally manufactured. 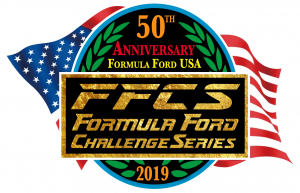 Specific list of eligible chassis per Formula Ford Challenge Series Rules. PCF: Post-Club Ford. Third generation raced through the 1986 season using front and rear inboard suspension and vertical dampers not activated by bell cranks. Specific list of eligible chassis. Other post 1981 cars may be accepted at the sole discretion of the FFCS Executive Committee. FVH: Formula Vee 1970-1975 subject to following provisions: must have working fan, including shroud, working generator, and tires shall be the treaded tires as specified for all pre-1070 Formula Vee’s. Cars with zero-roll suspension with twin shock/spring units are eligible, but cars with the later “mono-spring” suspension are not eligible. 2.4. Exceptions may be made for individual cars on a case-by-case basis at selected events, by the VRG Event Chairman with the concurrence of the VRG Board of Directors. 3.1.1. Helmet: Must meet Snell “SA” specification, of no more than eleven years prior, as evidenced by Snell Foundation sticker inside the helmet, or equivalent FIA specification (e.g., as of 1/1/2017 helmets must be SA2010 or later; no SA2005 helmets past 12/31/2016). Motorcycle (Snell “M” spec) helmets are not allowed. The helmet must be in perfect condition, with no evidence of previous impacts. Full-face helmets are required in open cars, and also recommended in closed cars. Driver’s name, DOB and any special medical conditions should be included in a label on rear of helmet. 3.1.2. Eye protection: A full face shield is required in open cars. Goggles or a face shield are highly recommended in closed cars. Eyeglasses, if worn, should have safety glass lenses. 3.1.3. Suit: All drivers are required to wear a racing suit made of approved fire-resistant material that covers the body from neck to wrists and ankles. The material must be approved by SFI, FIA, SCCA, or ASN. Three layers of fire resistant material are required, which may be obtained by a 2-layer suit with underwear, or a 3-layer suit. One-piece suits are highly recommended. A 3-layer suit, which meets or exceeds SFI 3.2A-5 specification (or FIA equivalent), worn with underwear, is highly recommended. 3.1.4. Underwear: Long-sleeve underwear of approved fire-resistant material must be worn under all two-layer suits, and is highly recommended under all other suits. 3.1.5. Gloves of a fire-resistant material are required. Two-layer gloves are recommended. Gloves may have leather-covered palms. 3.1.7. Socks must be of a fire-resistant material. 3.1.8. All of the above clothing must be in good condition, clean, free of excessive oil stains, not torn or frayed, with no holes or gaps. 3.1.9. Other clothing, made up in whole or in part of nylon, rayon, polyester, or any other synthetic non-fire-resistant material, may not be worn while racing. 3.1.10. Head and neck restraints, such as the HANS device, NecksGen, or Safety Solutions, will be mandatory in 2016 and beyond. Devices must meet SFI 38.1 and/or FIA 8858 standards. 3.2.1.1. Roll bars are required for all vehicles. The roll bar should be of sufficient height to protect the driver in the event of a roll-over. In an open car, the roll bar should extend a minimum of 2” above the driver’s helmet, with driver seated in normal position (Monoposto Classic cars may be exempted). In an enclosed car, the rollover structure should extend 2” above the helmet, or as close as practicable along the inside of the roof. Roll bar design, materials, and fabrication must be consistent with sound engineering practice, and excellent workmanship. The SCCA “General Competition Rules” (GCR) for 1979, or SCCA “Vintage” rulebook, is recommended for reference. 3.2.1.2. Side intrusion protection is permitted and highly recommended. 3.2.1.3. The number, and location, of supplemental braces is not specifically limited; however, bracing which appears to be intended solely for chassis stiffening and superfluous to driver protection may be disallowed. 3.2.1.4. All parts of the roll bar that may come in contact with the driver’s helmet, should be padded with SFI 45.1 or FIA Type A high-density roll bar padding. Period colors preferred. 3.2.1.5. Rollover protection as described above, should not substantially alter the original vintage character, style, or spirit of the car. 3.2.2.1. Seat: The driver’s seat is an integral part of driver protection. All drivers’ seats must provide secure support for the driver in the case of high impact loads associated with a vehicle crash. The use of contemporary racing seats is permitted. Period colors are preferred. Seats must be securely fastened to the vehicle frame, rollover structure, and/or vehicle floor. Seats fastened to sheet-metal floors must have substantial backing washers. Seats fastened solely to wooden floorboards will not be allowed. 3.2.2.2. Head restraint: There should be a substantial, padded head restraint within 3” (or less) of the back of the driver’s helmet. This restraint may be part of the seat, roll bar, or bodywork. 3.2.2.3. Belts: A five-point (minimum) racing harness is required for all cars. Lap and shoulder belts must meet current SFI or FIA standards, with date tags in place; anti-submarine straps must be 2” wide minimum. Two-inch (2”) wide shoulder belts are only permitted if worn with a HANS device. Y-type shoulder straps will not be permitted. Six-point harnesses are highly recommended for all cars where the driver is seated in a semi-reclining position. Buckles shall be quick-release type, with metal-to-metal latches. All belts must be in excellent or as-new condition, and must not be frayed, visibly worn, or faded. It is highly recommended that belts be replaced every five years, as evidenced by the manufacturer’s dated label. Undated belts, belts over 5 years old, or any belt which appears to be unsafe in the judgment of the Chief Scrutineer, may require replacement. 3.2.2.4. Belt mounting: Mounting geometry and hardware must conform to the belt manufacturer’s specifications. Where possible, all belts should be mounted to substantial frame members or the roll bar structure of the vehicle. In the case of sheet metal mountings, a 1/8” thick backing washer, 3” diameter, or plate of at least 9 square inches must be used. The mounting hardware and all attachment points must exceed the strength of the belt itself. Mounting eyes must be forged or welded closed. The minimum acceptable bolts used in the mounting of all belts and harnesses are as recommended by the manufacturer, or 3/8” diameter SAE Grade 5 at a minimum. 3.2.2.5. Arm restraints: Arm restraints are required in all open cars, effective 1/1/2008. Effective 1/1/2008, for closed cars (coupes and sedans), a restraint on the arm closest to the window is required, or a window net (restraint is preferred). 3.2.3.1. Extinguisher: The minimum requirement is a 2 lb. dry chemical hand-held fire extinguisher, or Halon equivalent. This must be securely mounted in the cockpit within reach of the driver while belted in. The extinguisher must have a charge indicator which indicates “full”. 3.2.3.2. Systems: On-board fire suppression systems (“fire bottles”) are highly recommended. An emergency label (red “E”) must appear on the outside of the car, indicating the activation point for all on-board systems. The activation point must be within reach of the driver while belted in, and should be accessible by a safety worker from outside the vehicle. 3.2.3.3. Firewall: The cockpit of the vehicle must be separated from the engine compartment, and fuel tank, by firewalls. Some exceptions may be allowed for fuel cells in certain formula and sports-racing cars. The firewall(s) and floor of the vehicle must prevent the passage of flame, fluid, and debris into the cockpit. All holes must be properly sealed. Larger holes must be sealed with metal. 3.2.4.1. Fuel cells are required. FIA FT3 specification cells, or equal, are highly recommended. For fuel cells not contained within the body structure, the bottom of the fuel cell should have a minimum of 6” of ground clearance. The mounting must be strong enough to resist impact forces during an accident. 3.2.4.2. Filler caps: All fuel filler caps must be securely fastened so as not to open during impact. Quick-release “Monza” type caps must be safety-wired shut. 3.2.4.3. Fuel filters having glass housings are not permitted. 3.2.5.1. Isolation: A cut-off switch is required on all cars. The switch should be accessible to the driver, while belted in, and must be accessible to safety workers from outside the car. The location must be clearly marked, preferably with the FIA sticker (red spark on blue triangle, “lightning bolt”). The cut-off switch must isolate the battery, must disable the ignition, must disable any electric fuel pumps, and must disable the charging system, so that the car is unable to start or continue running. 3.2.5.2. Battery: All batteries must be securely mounted and retained by a metal hold-down. The “hot” terminal must be properly insulated. Batteries mounted in the driver’s compartment must be a leak-proof type, have leak-proof caps, or be fully contained in a leak-proof container. 3.2.5.3. Insulation: All electrically “hot” terminals should be insulated: battery, cut-out switch terminals (if wired in “hot” side of circuit), starter solenoid terminals, etc. 3.2.5.4. Wiring: the wiring harness must be in good condition, with no signs of chafing, wear, or brittleness. All wires must be securely mounted with wire ties or clamps to prevent chafing. Wherever wires pass through metal bulkheads, proper grommets must be used to prevent shorting. 3.2.5.5. It is recommended that electric fuel pumps be wired through a low-oil-pressure switch, or inertia-activated switch, which disconnects power to the pump in the event of an accident. 3.2.6.1. Throttle return springs: There must be a minimum of two (2) throttle return springs, external to the carburetor or fuel injection throttle, each capable on its own of closing the carburetor butterflies. In the case of multiple carburetors, each carburetor must have its own external throttle return spring. 3.2.6.2. Fluid overflow protection: All engine breathers must lead to a catch can of at least one quart capacity. It is recommended that gearbox breathers also have a catch can. Cooling system overflow must be contained in a catch can of at least one quart capacity. Fuel overflows should not be contained in any catch cans. No oil, coolant, fuel, or fluid leaks of any kind will be permitted. 3.2.6.3. Drain plugs: The engine oil, transmission oil, and differential oil drain plugs must be safety wired. It is recommended that all other drain plugs be safety wired also (radiator, etc). 3.2.6.4. Coolant: Water pump lube, “water wetter”, and anti-corrosion additives are acceptable. Antifreeze is not allowed except when noted in the entry information for that specific event. 3.2.6.5. Flywheel/clutch: It is recommended that a scatter shield or explosion-proof bell housing be fitted to all cars where the failure of the clutch or flywheel could result in a hazard to the driver. Refer to SCCA GCR for recommended design. 3.2.6.6. Drive shaft: It is recommended that all front-engine, rear-wheel-drive cars have a 360o safety hoop enclosing the drive shaft, to protect the driver in the event of u-joint failure. 3.2.7.1. No part of the suspension or steering may have excessive play or looseness. All suspension components must be in excellent or like-new condition. It is highly recommended that all suspension and steering parts be crack tested on a regular basis (Magnaflux, dye penetrant, x-ray, etc). 3.2.7.2. Captive washers are required over all open-ended spherical ball joints (“Heim” joints). 3.2.7.3. It is recommended that wood-rim steering wheels be replaced with metal-rim wheels. 3.2.8.1. Dual braking systems are required. This may be accomplished with dual master cylinders, a tandem master cylinder, or a single master cylinder plus mechanical emergency brake. 3.2.8.2. All braking systems must be in perfect condition, with no evidence of fluid leaks, cracked or distressed parts, or any malfunction of any type. Hydraulic lines and hoses must be in excellent or as-new condition throughout. 3.2.8.3. All cars, except formula cars, must have at least one red brake light in working order. Two are recommended. Formula cars must have a working rain light, and may also have a brake light. 3.2.9.1. Wire wheels must be in perfect condition, with no missing, broken, or loose spokes. Replacement wire wheels may have more spokes than originals, for added strength. 3.2.9.2. All wheels must be free of cracks. Regular crack testing is recommended. 3.2.9.3. Lug nuts should be of the “open” type for verification of thread engagement. Owners may be required to remove “acorn” style enclosed nuts at Tech Inspection, to verify thread engagement. 3.2.9.4. Modern aftermarket racing wheels (subject to size restrictions) which have a period appearance are permitted, and encouraged to replace originals where the original wheel is known to be weak and prone to failure. 3.2.9.5. Tires must have at least 2/32” of measurable tread, across the entire tread width. Tires must be of a type designated for racing, or a street tire with a DOT speed rating appropriate to the particular vehicle under racing conditions. 3.2.10.1. All body panels must be securely mounted. Engine hoods and trunk lids must be secure. Engine hoods should have redundant closures. 3.2.10.2. Exhaust systems must exit outside the car and behind the driver. Exhaust components must be securely attached to the vehicle. 3.2.10.3. A transparent windscreen capable of deflecting debris away from the driver, is required. 3.2.10.4. Mirrors: The minimum requirement is two mirrors, which provide visibility along both sides and the rear of the car. Insufficient mirrors, in the judgment of the Chief Scrutineer, may require immediate rectification. 3.2.10.5. All cars without an exposed roll bar must have substantial tow hooks mounted to the front and rear of the vehicle. The eye should have a 2” diameter opening, minimum. 3.2.10.6. Headlights, and all glass lenses, must be taped. Brake lights must remain visible if taped(clear tape). 3.2.10.8. Rigid (metal, fiberglass, etc) tonneaus, covering the passenger compartment beside the driver, are not permitted, except the case of certain sports-racing cars which were originally so equipped (Jaguar D, Lotus XI LeMans). Fabric tonneau covers are allowed. 3.2.10.9. Undertrays, where fitted, must have drain holes. 3.2.10.10. It is highly recommended that wooden floorboards be replaced with metal floors. 3.3. TECHNICAL INSPECTION: Regular inspection and compliance with safety requirements is the responsibility of the car owner. An inspection will be performed by VRG Technical Inspectors on every car at each VRG event (scrutineering). All cars must pass “Tech” before entering the track. The inspection may consist of items above, plus other items at the discretion of the Chief Scrutineers. The Chief Scrutineers have the final authority to reject any car as unsuitable for competition. 3.4.1. Requirement: All cars are required to have a vintage log book. A log book from any VMC-recognized vintage club, or a VRG log book, is acceptable. The log book must be presented at Tech Inspection at every VRG event entered. 3.4.2. Purpose: The purpose of the log book is to record an accurate history of events attended, tech/safety inspections performed, defects found (if any) and a date/event by which any defects must be corrected. It provides information to quickly verify the identity of the car, its basic specifications and a record of ownership. 3.4.3. Procedure at time of Tech Inspection: During inspection of a vehicle, if any deviation from VRG Rules & Regulations is found, it will be noted in the vehicle’s log book. The Tech Inspector will also note when the defect must be corrected. 3.4.4. Log book from another club: A car should have one, and only one, vintage log book. Since VRG accepts and uses log books from other VMC-recognized clubs, a VRG log book will not be issued to a car which has a log book from another club. 3.4.5. VRG log books: A VRG log book may be issued to eligible cars which do not have an existing log book from another club, or as a replacement for a full log book. 3.4.5.1. General: A VRG log book is associated with the vehicle, not the owner/driver. 3.4.5.2. Application Procedure: The car owner must submit a completed Log Book Request Form, along with two 3 x 5 full-frame photos: one ¾ front and one ¾ rear showing all four sides of the car, sitting still, not on a trailer. The Request Form will be presented to the Tech Inspector at the car’s first event. The Tech Inspector will conduct a complete inspection and sign the form where indicated. The VRG Technical Committee will review the application. When approved, the Log Book Officer will fill in the appropriate pages of a VRG Log Book, attach the owner’s photos, assign and record a logbook identity number, and mail the log book to the owner. 4.1. General: Performance modifications must be in keeping with those available during the period of eligibility. For VRG Production Car and Sedan Classes with a “v” suffix, the “period” is defined as pre-1973. For Production and Sedan Classes with an “H” suffix, the period is defined as pre-1980. A Production Car or Sedan manufactured before 1973, but modified in accordance with later practice, may be reclassified into the relevant “H” class. Modifications which improve reliability, durability, strength, or convenience without significantly improving performance will be allowed when they do not visibly detract from the vintage character of the vehicle. 4.1.1. Updating/backdating OEM equipment: Updating and backdating within a single model is permitted. However, updates to Production Cars and Sedans beyond 1972 are not allowed for “v” classes, and beyond 1979 not allowed for “H” classes. Intra-model updates to pre-1973 cars, which cross the 1973 time line, may result in re-classification to the relevant “H” class. 4.1.2. Upgrading within a model: Upgrading to period-correct OEM optional equipment, option packages, state of tune, or other designation within a single model is permitted. However, such alterations may result in reclassification of the car. Examples are Alfa Normale to Veloce; Aston Martin to Vantage spec; Corvette small block to big block; etc. However, owners are urged to discuss any such upgrades with the VRG Eligibility Committee, to determine when the alternative is actually a different model rather than a variation of a single model. 4.1.3. Aftermarket equipment: Period aftermarket equipment is permitted, subject to the detailed rules herein. Major aftermarket upgrades (e.g. period superchargers) may result in reclassification of the car. Modern reproductions of period aftermarket equipment are allowed, provided the modern reproduction is identical to the original period device. Modern aftermarket equipment which has no historical precedent, in period, will not be permitted. 4.1.4. General dimensions: Original wheelbase, track, overall length, height, and width of car must be maintained. 4.1.5. Weight: All production cars must adhere to minimum weights, as recognized by period SCCA PCS or OEM listed curb weight. Formula cars and sports-racers must adhere to period weight specifications for their type, where applicable. Cars which have been significantly lightened must be identified by the owner on the race entry form, and are subject to reclassification. Undeclared, lightened vehicles will be considered grounds for serious disciplinary action. 4.2.1. General: The engine must be the type, size, and design as originally fitted to this model by the manufacturer, or a listed option, and must be in the original location. In unusual cases where an original engine is unavailable, any substitute engine must have prior written approval by VRG, and must be period alternate. In the case of non-production cars or “specials”, the engine should be a type that was originally used in that car during the period. In the case of certain racing classes with specific rules, such as Formula Junior, Formula Ford, etc, engines must conform to the period rules of that class. 4.2.2. Displacement: The engine must be the original displacement available in that model, with maximum overbore of 0.040” (bores up to 3.5”) or 0.060” (bores over 3.5”). Stroke may not be altered from original. The owner must declare the precise, actual displacement (including overbore) of his/her engine on the race entry form. Undeclared oversize engines will be considered grounds for serious disciplinary action. 4.2.3. Construction: The engine block, cylinder barrels, and crankcase must be the same type, material, size, and design as originally provided by the vehicle manufacturer. The number and location of main bearings may not be altered. Cylinder heads must be the original type, material, and design, or an approved period aftermarket type. The number and location of valves may not be altered. Modern aftermarket blocks and heads are prohibited, unless identical to original OEM items or period aftermarket items, and require prior written approval of VRG. 4.2.4. Internal components: Within the limits of the original block, crankcase, and head, substitute internal components are permitted: pistons, rods, bearings, cam(s), and valves. Modern aftermarket internal components (Carillo, Venolia, Crane, Isky, etc) are allowed. Valve train components may be replaced with aftermarket parts of the same type as original. 4.2.5. Internal modifications: Engine modifications such as porting, lightening, balancing, blueprinting are allowed but limited to those available and commonly done in the period. Modifications beyond these may result in reclassification of the car. 4.2.6. Lubrication systems: Addition of oil coolers and supplemental filters is allowed. Addition of external pressurizing system (“Accusump”) is allowed. Oil pans and pumps may be modified or replaced by aftermarket parts. Conversion from wet sump to dry sump system is not allowed, except in VRG Class TA. 4.3.1. Fuel: Commercially-available gasoline must be used. Addition of compounds containing oxygen or nitrogen is prohibited. In certain cases where historically accurate, the use of alcohol fuel may be permitted. The driver must notify the Safety Steward at each event, and affix a decal (white letter “A” on red background) to the car indicating alcohol fuel. 4.3.2. Induction system: The system of induction (carburetors, fuel injection) must be the type originally offered by the vehicle manufacturer for this model. Modern aftermarket induction systems are prohibited, unless identical in design and appearance to period-produced aftermarket systems, and have prior written approval of the Eligibility Committee. Carburetors must be of the original type (downdraft, sidedraft) as listed by the manufacturer for that model. The original number of throttles (butterflies) must be maintained. Substitution of a different make or size of carburetor (Weber for SU, Holley for Rochester, 2” for 1-3/4”) may result in reclassification of the car. 4.3.3. Forced induction systems: Modern aftermarket forced induction systems are not permitted. OEM superchargers or turbochargers are allowed, if homologated by the vehicle manufacturer in the period. Period aftermarket superchargers (Judson, Shorrock, Wade) may be allowed if historically accurate, with prior written approval by VRG, and subject to reclassification of the car. 4.3.4. Exhaust systems are free. Tubular headers, open exhausts, “free flow” exhausts are allowed. Modern aftermarket components may be utilized. Note that local sound restrictions may be in place at some events. 4.4.1. Ignition: Must be of original type and design as provided by manufacturer. Electronic ignition is allowed, but the spark must be triggered and distributed from inside the distributor (no crank triggers). Modern aftermarket components (coils, spark plugs, wires, etc) are allowed. Rev limiters are allowed, and suggested for safety reasons. 4.4.2. Electrical: It is recommended that all cars be fitted with a working charging system. Generators may be replaced by alternators. Modern aftermarket alternators are allowed. 4.5.1. General: The clutch, transmission, and final drive systems must be the type and design as originally fitted by the vehicle manufacturer. Within the confines of the original housings, internal components are free. 4.5.2. Transmission: The gearbox must have the same number of forward speeds as supplied by the manufacturer, or homologated as an option for that model. Ratios are free. Reverse must work (driver actuated lockout is permitted). The system of gear synchronization must be as originally fitted by the manufacturer. 4.5.3. Final drive: Ratios are free. Limited-slip differentials may be fitted, if originally available from the vehicle manufacturer or as a period aftermarket device. The original casing must be retained. Modern aftermarket axles and wheel bearings may be used. 4.6.1. General: The system of suspension and steering must be as originally fitted by the manufacturer. Replacement components of the same type are allowed. 4.6.2. Suspension: Spring type (coil, leaf) and shock type (telescopic, lever) must be as originally fitted by the manufacturer. Spring and damper rates are free. All suspension components must attach to the original mounting locations (altering of pick-up points is prohibited). Anti-roll bars are free. Alignment settings are free, within the confines of the original pick-up points. Cars may be lowered no more than 1” from original factory ride height. Cars with leaf springs may add longitudinal locating devices (traction bar, torque arm). Cars with live axles may add lateral locating devices (Panhard or Watts). Bushings may be replaced with stiffer materials, but may not be converted to spherical rod ends (“Heim” or “Rose” joints). Suspension parts (hubs, spindles, etc) may be strengthened or replaced for safety as long as the track width, wheelbase, and suspension geometry is not altered. 4.6.3. Steering: The original type (cam & peg, worm & roller, etc) as supplied by the manufacturer may not be changed. Steering ratios are free. Components may be upgraded for safety. 4.7. BRAKES: Brakes must be the original type (disc, drum), size, and design as supplied by the manufacturer, or listed option, for the model. Updating from drum to disc will result in reclassification if eligibility timeline (e.g. 1972) is crossed. Lining and pad materials are free. Rotors may be drilled or grooved, but must be same diameter, thickness, and material as originally supplied. Modern aftermarket calipers are not permitted. Brake ducting is permitted, as long as bodywork is not altered. Adjustable brake bias control is permitted if it is not accessible to the driver while racing. 4.8.1. General: Changes in wheel construction must increase strength, rather than simply reduce weight, of the wheel. 4.8.2. VRG Production Car Classes and Sedan Classes: Diameter must be original, except 13” may be substituted for 12”; 15” may be substituted for 16”; and 16” may be substituted for 19”. Rim widths may be increased 1.5” over maximum original or optional wheel rim. Period-looking aftermarket wheels that meet these dimensional standards are acceptable. Wire wheels may be replaced with those having more spokes (72 replacing 60, 60 replacing 48) as long as legal rim width and offset are maintained. 4.8.4. VRG Formula Car Classes: Wheel diameter, rim width, and construction must conform to Monoposto Classic rules for the car. 4.10.1. Body: Configuration must be as originally supplied by the manufacturer. All body components (fenders, lids, etc) must be of original material, thickness, contour, and design. Supplemental aerodynamic devices such as spoilers, air dams, and wings will not be permitted, unless the owner can show that the car was raced in that configuration in the period. Fender flares are not permitted in VRG Class denoted by suffix “v”, and are only permitted in Classes denoted by suffix “H” if the owner can show that the car was raced in that configuration in the period. Original-looking exterior trim, such as grills, must be in place. Bumpers may be removed. On open cars, windshields may be removed if replaced by a suitable transparent windscreen in front of the driver. Where originally supplied, headlights should be fitted and taped. Commercial decals are permitted if the car appears as it did in period. Modern (contemporary) advertising is not allowed. Convertible tops (soft) should be removed. Detachable hard tops are subject to approval of the fastening method by the Chief Scrutineer. 4.10.2. Interior: Interiors of all cars must appear neat and finished. Carpeting, floor mats, and any loose trim (boot covers, sidescreen bags) should be removed for racing. Racing-type seats are permitted, but it is suggested that they have a period appearance, particularly in open cars in VRG Classes denoted by suffix “v”. Passenger seats should be fitted in production cars. Additional gauges, and modern replacement gauges, are permitted but the overall dashboard should have a period appearance. Side door glass may be removed from closed cars. 4.10.3. Race numbers: Numbers must be of a size, stroke, and color that makes them legible, at a glance, to timing & scoring officials. Static-cling or magnetic numbers should not be used. 4.10.4. General presentation: Cars must be presented in a clean, neat condition. Dents, rippled panels, unrepaired accident damage, and visible rust are not permitted. Panels may not be finished in primer, unless originally raced that way. 5.1. Why we need rules of the road: It is our goal to make vintage racing enjoyable and safe. If we do not all agree to play by the same rules, problems may occur. By establishing rules of conduct we all know how we are expected handle on track decisions. By stating our rules of conduct it also makes the determination of fault in the case of an incident simpler. 5.2. Driver attitude: It is important to understand that vintage racing is somewhat different from most other forms of auto racing. Our race groups are often made up of cars that have very different speed potentials. Even when lap times are similar, one car may be much quicker down the straights while another is perhaps lighter and can brake later and carry more corner speed. The result is the two cars seem to be in each other’s way much of the time. Add to this the fact that our groups will have very experienced drivers racing at 9/10 in fast cars mixed in with driver with limited racing experience driving cars with less speed potential and happy to be driving at 7/10. Such is the nature of vintage racing. This means you must understand and accept these differences and be willing to adjust your driving to accommodate these differences. 5.3. Overtaking: It is the responsibility of the overtaking car to make a safe pass. When you are the faster car, the car being passed has the right of way. Even when the blue flag (blue w/ yellow diagonal) has been shown to the slower car, the slower car is not required to yield the desired line through a turn. If you have actually established a lead, that is, the front of your car is clearly ahead of the car you are passing, at or before the turn in point, you have the right to share the corner with the car being passed. The car being passed needs to yield the apex, but you still don’t have the right to push the car being passed off the road. You have not completed the pass until the rear of your car is in front of the car being passed. Only then, have you fulfilled the responsibility for a safe clean pass. 5.4. Being overtaken: All drivers have a responsibility to keep an eye on their mirrors. You must be aware of the cars that maybe about to pass you. If the car behind you is clearly a faster car that is going to pass you, or you simply desire the car to pass you, point to the side you want to be passed on. This is best done as you exit a corner. That point-by is valid until you reach the turn in point for the next corner. When you give a point-by stay on your normal line. The only exception being, when you give a point-by as you are approaching a corner. In that case, you are indicating that you will share the turn with the overtaking car. You MUST then leave room for the faster car to make a pass. 5.5. In traffic moves: When in heavy traffic typical of the first few laps, it is imperative that you not make any rapid line changes without first being sure that you are not going move into the path of another car so as to cause contact between cars. 5.6. Blocking: When racing for position with another car you may adopt a defensive line so as to make a pass more difficult. You must not weave back and forth for the purpose of keeping another car behind you. You must not make sudden moves off your normal line to shut the door on a car that is carrying more speed than you. 5.7. Damage avoidance: If a car in front of you loses control you should treat this as an automatic waving yellow. The car in trouble may be two or more cars in front of you and the car right in front of you may slow to avoid contact with the out of control car. Do not look at this as an opportunity to pass. When you get past the car in trouble you can resume racing. 6.1. Objective: We have a system in place to review on-track incidents to establish the facts and identify fault if any exists. Should a driver be found at fault, a penalty shall be determined. The purpose of the penalty is to encourage a change in driver behavior. 6.2. Types of incidents: Most incidents can be categorized into one of three types. First being a case where the driver was the victim of circumstance, such as a mechanical failure or an unknown track condition such as fluid that was not there on the previous lap. The second case being the result of poor judgment on the part of the driver. The third and most serious is when a driver causes damage or injury to another car or driver as a result of aggressive driving. 6.2.1. Victim of circumstance: This type of accident can be very serious and can involve other cars and drivers. They must be carefully reviewed to be sure that any drivers involved did not contribute to making the accident worse than it needed to be. Lacking a case of poor judgment that resulted in increased damage, this type of accident may not result in any penalty. 6.2.2. Poor judgment: Poor judgment…In a case where a driver makes an error that results in a loss of control and does not result in any damage, a simple warning may be issued. If there is minor damage, limited to the car losing control and not the result of overly aggressive driving, a warning may be all that results. If there is serious damage to the car involved, that driver may be excluded from the remainder of the event and a penalty may be issued. If the loss of control results in damage to another car the driver will be excluded from the remainder of the event. A penalty will be issued and reported to VMC. 6.2.3. Aggressive driving: When a driver is considered to have made an aggressive move that resulted in any damage to any car, that driver will be excluded from the remainder of that race event. A probation period of up to 13 months will also result. 6.3. Suspension: In the case of a driver on probation for aggressive driving being found at fault in a second aggressive incident while still on probation, a 13 month suspension will be issued. When a driver on probation for an incident involving poor judgment is involved in a second incident a suspension of up to 13 months may be issued depending on the circumstances. 6.4. Reporting responsibility: All drivers are expected to have control of their car at all times. Any driver, who in any session, exhibits loss of control by putting all four wheels off the racing surface or is involved in an incident that results in contact with another car, course barrier or any other object must report to the Black Flag Steward in Pit Lane immediately. The trip back to the pits should be taken cautiously as there may be unrecognized damage to your car. The Black Flag Steward will evaluate the condition of both the driver and the car to determine if they may be sent back on track or to the paddock. Incidents involving contact will be sent to the impound area to be reviewed by the Driver Committee. Failure to report to the Black Flag Steward after such a loss of control may lead to a probationary period in addition to any penalty resulting from the incident itself. Remember: If you spin, both feet in… until you come to a full stop! General: Special provisions for individual makes & models are intended to allow modifications to overcome well-known, inherent limitations of original design that impact safety, strength, or reliability. Provisions will not be made to improve performance, or “level the playing field” for a specific model. Any member may request a special provision from the VRG Board of Directors. If granted, the provision will be documented for the benefit of others in this Appendix. Elva Courier: MGA rear axle assembly is allowed. Conversion of hubs to permit use of MGB 4.5 x 14” steel wheels is allowed. Porsche 356 (all years): Use of later crankcase (356C, 912 types) is allowed. Engine displacement must remain correct for the year. Lotus 18: conversion to VW gearbox is allowed. Mini: The “Group 2” Wing Extension (p/n C-AJJ3316/AJJ3353 or equal) is allowed. Tires must not extend beyond this wing extension. GT/Pinto: 1971 to 1980 Ford Pintos conforming to a strict set of rules are eligible. These rules include: minimum weight 2380 lbs with driver; alterations to body panels and chassis mounting points are prohibited; all four wheels must be 13” diameter x 7” width; SVRA Group 8 Tire List shall apply; front brakes must be OEM single piston caliper units on OEM spindles; rear brakes must be OEM drums; engine is 2300cc with OEM cast iron block and head, OEM crankshaft, connecting rods and pistons; intake manifold is OEM; carburetor is Holley #4412 500cfm; transmission is OEM 4-speed; rear axle is OEM. General appearance and presentation shall conform strictly to Paragraph 4.10.4, above.